On 7 January 2009, the Vessel loaded with 4080 tonnes of asphalt departed Ulsan, Korea and sailed to Ningbo, China. 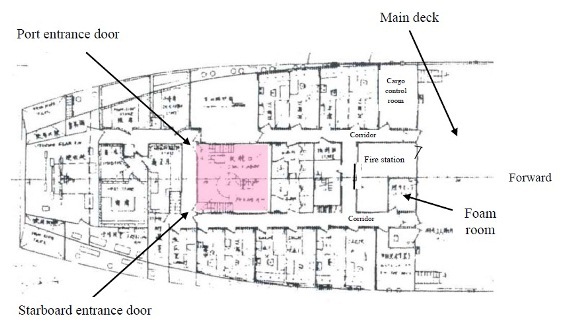 On 9 January 2009 at about 1230, while the Vessel was under way at approximate position 31º25.7’N, 124º35.8’E, about 120 nautical miles east of mouth of Changjiang, the Second Officer on duty in wheelhouse noticed dense smoke came out from the entrance door at port side of the funnel. Immediately he informed the Master who was in the wheelhouse. Then the Second Officer heard the main engine telegraph ringing, he answered the telegraph by pulling its handle to “STOP” position. 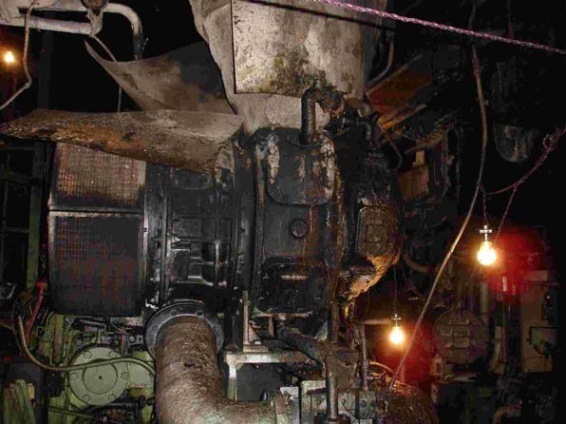 The Second Officer telephoned to the engine control room at once and the Third Engineer on duty in engine room answered him that the exhaust gas duct of the main engine was on fire. Then the main engine was stopped. The Second Officer made announcement through the public address system informing all the crew members that the exhaust gas duct was on fire and everyone should respond in accordance with the emergency fire fighting plan. At about 1232, the Second Officer pressed the fire alarm and announced through the public address system again requesting the crew to respond in accordance with the emergency fire fighting plan. The Second Engineer operated the remote control devices on poop deck to shut off the quick-closing valves of the fuel oil tanks in engine room in order to stop fuel oil supply to the main engine and diesel generators. Then he went to the port entrance door of engine room in the crew accommodation on main deck. At there, he joined the Chief Motorman and Third Officer to open the entrance door to check the condition of engine room. Dense smoke and flame were found coming out from the engine room. At about 1234, the Chief Officer reported to the Master who was in the wheelhouse that the engine room was on fire and the fire was fierce. The Second Officer in wheelhouse announced through the public address system informing all crew members that the engine room was on fire. At that time, the emergency fire pump located in the forward of the Vessel was started by the Fourth Engineer. The fire had spread into the crew accommodation and the Third Officer and other crew members used fire hoses to provide boundary cooling to the forward bulkhead of accommodation superstructure. At about 1236, the Second Officer instructed the sailor trainee (“Trainee A”) to hoist the “Vessel Not Under Command” shape at the mast above the wheelhouse, but that was not done as there was too much smoke and hot air draughts coming out from the funnel towards the mast. At about 1237, the Master instructed Chief Officer to carry out heads count. He also telephoned to engine control room ordering the crew on duty to evacuate, but nobody answered his call. After heads count, it was found that the Third Engineer and the motorman (“Motorman B”), who were on duty in engine room, were missing. 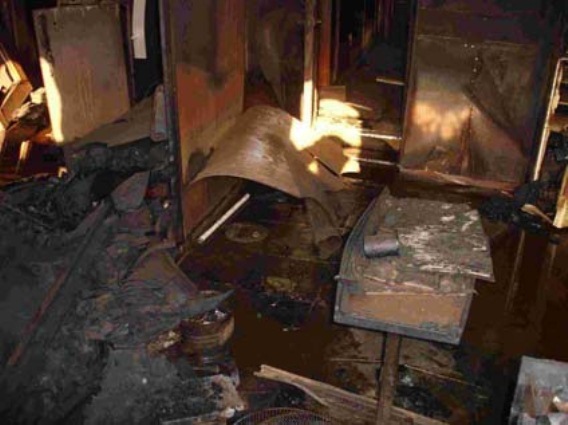 At about 1238, the engine room fire had spread to the accommodation spaces and was out of control. As the Chief Engineer forgot to bring the walkie talkie with him, he through the Chief Officer asked Master’s permission to release carbon dioxide gas into the engine room for smothering the fire. As the Third Engineer and Motorman B were still inside the engine room, the Master refused the release of carbon dioxide gas. He instructed Chief Officer and Chief Engineer to send a rescue team into engine room for the rescue. But the fire was so fierce that they were not able to organize the rescue operation since it was too risky for the team to enter into engine room. At about 1244, as smoke was found coming out from the fire station where the carbon dioxide gas bottles were stored, the Chief Officer asked Master again for his permission to release carbon dioxide gas into engine room for smothering the fire. The Master agreed. The Chief Officer then instructed Third Officer to go into the fire station to trigger release of carbon dioxide gas into engine room. There were 30 bottles of carbon dioxide gas for smothering engine room fire. However, the pulling wire for the linked release had been disconnected rendered the gas had to be released individually. According to the Third Officer’s statement, the Third Officer released only 4 bottles of carbon dioxide gas because he was aware that the Third Engineer and Motorman B had not evacuated from the engine room yet. At about 1248, the Master ordered all the crew members to muster at boat stations and lower the port and starboard lifeboats to embarkation deck ready for launching. 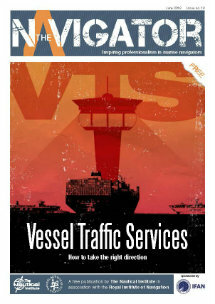 The Second Officer called nearby ships for assistance through VHF radio. At about 1251, as the fire was still out of control, the Chief Officer instructed the Bosun and Third Officer to enter the fire station again to release more carbon dioxide gas into the engine room. At that time, there was a lot of smoke in the fire station. After releasing 13 bottles of carbon dioxide gas, the Bosun and Third Officer came out of the fire station, exhausted by the dense smoke inside. They then closed the door and ventilator cover of the fire station. At about 1252, digital selective calling (DSC) messages asking for help were sent out through Inmarsat-C from the Vessel. At about 1300, as the fire was still out of control, the crew decided to launch the lifeboats. The Bosun and an able seaman (“Able Seaman B”) tried to lower the starboard lifeboat. As strong wind was blowing towards starboard side of the Vessel and the gearbox of propulsion engine of the lifeboat was out of order, they abandoned launching of the starboard lifeboat. The majority of the crew was then mustered at port lifeboat station to launch the port lifeboat. The lifeboat was lowered to sea level with the Chief Officer, Third Officer, Chief Engineer and some other crew members on board the boat. They tried to start the lifeboat propulsion engine several times but were in vain. The lifting hooks of the port lifeboat were then disengaged and the boat was moored at midship of the Vessel with the assistance of some other crew members on the main deck of the Vessel. Several crew members also climbed down to board the lifeboat using the rope ladder. At that time, the emergency fire pump became malfunction and stopped. At about 1330, when the Master found that the Chief Officer, Chief Engineer and other crew members were on the port lifeboat, he shouted to the crew saying that he had not ordered abandoning ship. He ordered them all back to the Vessel. Then the majority of the crew members on the boat climbed back to the Vessel using the rope ladder but three trainees (“Trainee B”, “Trainee C” and “Trainee D”), two motormen (“Motorman C” and “Motorman D”), an able seaman (“Able Seaman C”) and the Steward remained in the lifeboat and refused to go back onto the Vessel. 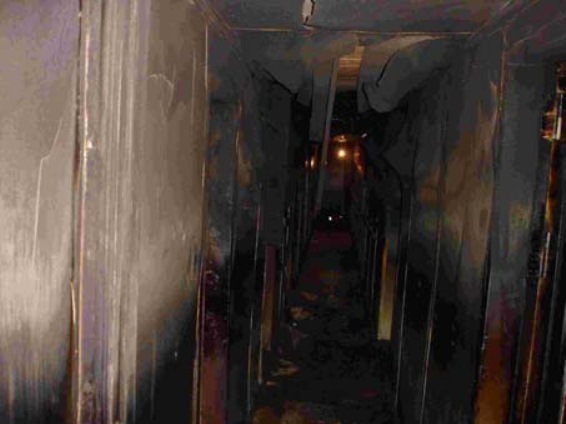 At about 1425, the smoke coming out from the accommodation spaces had subsided. After the Master had received instructions from the ship management company, he ordered the Chief Officer to drop anchors. At about 1435, two anchors of the Vessel were dropped. Once the Vessel was anchored, the bow pointed against the strong wind, and together with high waves, the port lifeboat swayed excessively. At about 1443, the two mooring ropes of the lifeboat were parted and the boat drifted astern. The Master instructed Chief Officer and other crew members to save the crew members on board the lifeboat. When the boat drifted to the port side aft and abreast with the engine room of the Vessel, Trainee B, Trainee C, Motorman C and the Steward grasped the manropes and the lifting hooks that had been left suspended from the port lifeboat’s launching appliance of the Vessel. They intended to climb back on the Vessel using the manropes and lifting hooks. The Trainee D, Motorman D and Able Seaman C remained on board the lifeboat, which eventually drifted away from the Vessel. Crew members on board the Vessel operated the winch at the lifeboat station at once to winch up the lifting hooks and rescued Trainee B and the Steward back on the Vessel. While Trainee C and Motorman C lost their grips of the manropes and fell into the sea. The Bosun threw a rope with knots into the sea immediately. Trainee C grasped the rope in water and he was eventually lifted up and back on the Vessel with the assistance of the crew members. However, Motorman C, who failed to grasp a mooring rope thrown to him in the water, was drifted away by strong current and lost in the sea. The lifeboat, which drifted away with three crew members onboard, was found later and they were rescued by a Korean cargo ship. At about 2130, the salvage tug “Dong Hai Jiu 112” arrived at the scene for the salvage. 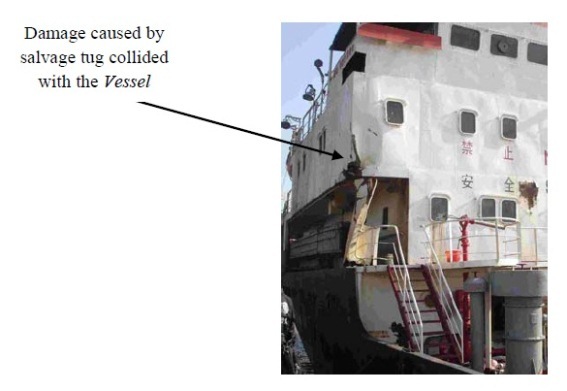 In the morning of the next day, on 10 January 2009, towing preparation work was carried out by the tug but it was subsequently abandoned due to too rough sea condition (see Fig.10 the damage caused by too rough sea condition). In the morning of 11 January 2009, when the sea condition improved, the rescue team from the salvage tug successfully embarked the Vessel. They entered into the crew accommodation and engine room to extinguish the smouldering fire completely. The bodies of Third Engineer and Motorman B were found lying at the starboard stairway leading from engine room to the starboard entrance door on main deck. In the afternoon of 11 January 2009, with the assistance of another salvage tug “Dong Hai Jiu 198”, the two tugs commenced towing the Vessel to the waters off Ningbo. In the afternoon of 13 January 2009, the Vessel was alongside No.9 Berth, Zhenhai port, Ningbo. 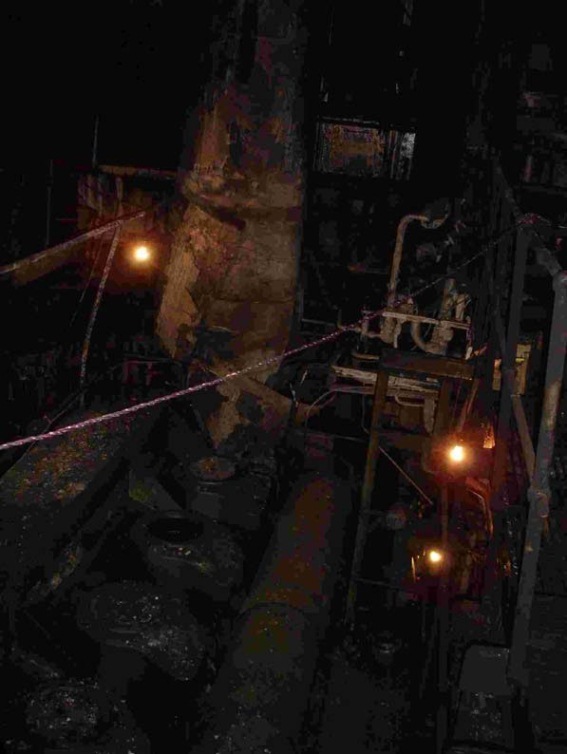 The extensive damages caused by the fire in the engine room and in the accommodation of the ship is shown in the following photos. The investigation into the accident deduced that the most probable cause of the accident was main engine crankcase explosion. 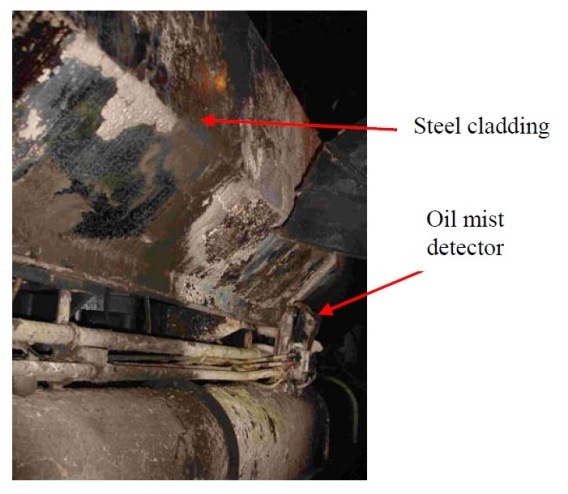 The explosion resulted release of large quantity of oil mist and/or flammable vapour from main engine crankcase into engine room which were ignited and caused the fire. 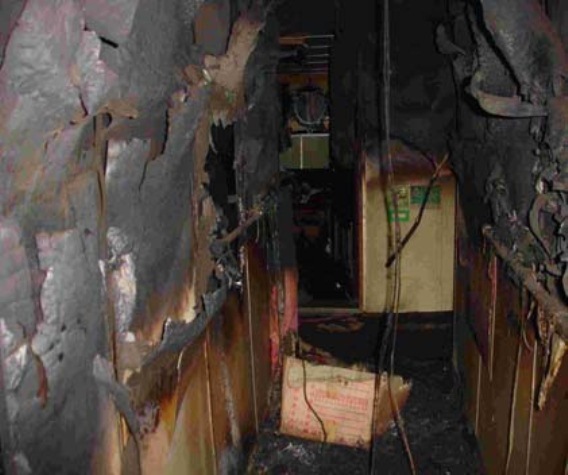 The fire spread from engine room into crew accommodation and burnt out the combustible materials in its path causing serious damage. Problem existed in the main engine and its lubrication system for a long time without attention being given. 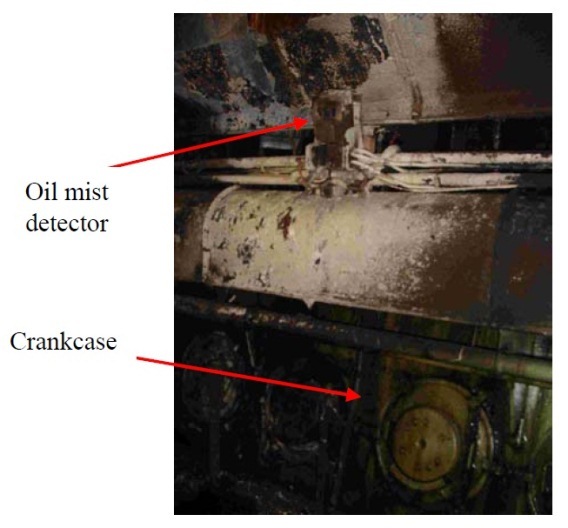 The main engine oil mist detector was defective and failed to give out alarm before explosion occurring inside the main engine crankcase. 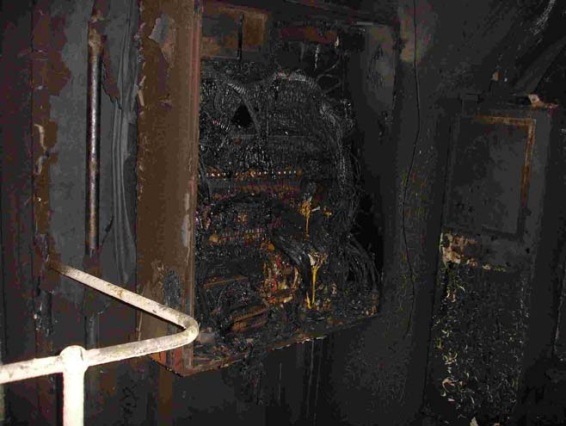 The engine room fire detection and alarm system was defective, therefore the crew members were not alerted of the fire when it started. 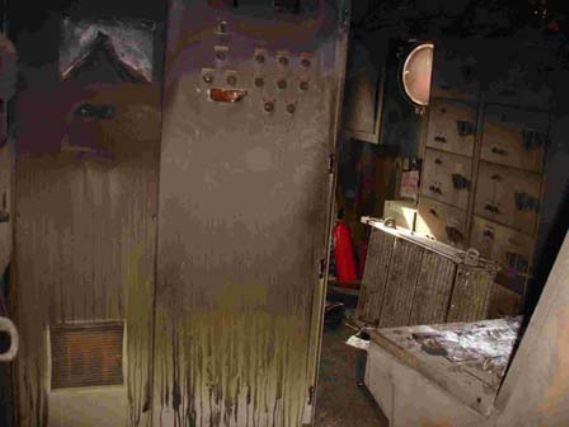 The self-closing device of the port engine room entrance door might have failed or the door had not been properly closed by the crew members resulted into extensive fire damage to the crew accommodation. Leadership displayed by the Master and senior officers in handling emergency situations was poor and crew members onboard were not adequately trained, through regular and systematic drills and exercise, in dealing with emergency situations. Implementation of safety management system onboard was not effective, which resulted into major non-conformities in the areas of crew trainings, emergency preparedness, maintenance of ship’s firefighting and life saving equipment. Also, the shipboard internal audits and master review failed to identify and rectify these non-conformities at an earlier stage. Proper inspections and maintenance of ship equipment are carried out at all times. Shipboard personnel must be trained systematically through regular drills and exercises to enhance their competence in handling emergency situations. Internal audits and management reviews are to be conducted systematically to identify system deficiencies for improvement/rectification at an early stage.